Hi its Deb certainly has been a long time since my last post. This is because everyone here at MHB has been working hard to bring you only the best products and we take notice of what you say. 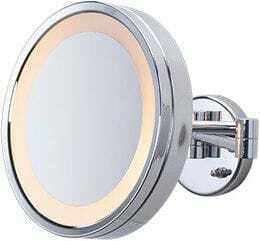 This week after a very long wait we have finally landed the new HL85C direct wired wall mount magnifying mirror. It’s finally been made with a 5x magnification; we know that will make many of you very happy. It’s has all the same specifications in terms of diameter, halo light, 40cm extension, easy clean chrome finish. For those that have not heard of direct wire before it simply means that there is no plug and the mirror has been set up so that your electrician can mount it on the bathroom wall and connect directly to the house wiring. That way you no not have to have a power point and a curly cord as the other models do. I guess it’s the minimalist look that some search for these days. It’s often found in hotels bathrooms but seems to have made its way of late to new houses that want style and convenience. Likely in the next shipment MHB will land the new LED versions of the wall mount mirrors, with one model in particular we like and have had feedback over is an 8x magnification version which will really help those who need a stronger mirror when they remove their glasses. We would expect that it's at least 12 weeks away for this lighted magnifying mirror shipment so we will be sure to let you know as soon as they land. On another note Australia post has recently raised their parcel postage rates which we unfortunately will have to pass on I was told the head of Australia post was an ex bank manager so I guess rate increases will always be on the cards in the hunt for profits. Well its only a short post today, I know there are other items coming through and a little early to announce just yet. As always don't forget to smile and have a great week.